The common names of Bursera simaruba in Guatemala include palo jiote, chacaj, indio desnudo, Palo chino, Chacah, Chacah Colorado. Although Bursera simaruba is the species people generally speak about, in fact there are many similar species throughout Guatemala. This tree is widely used in Guatemala as a live fence. It grows rapidly and is easily propagated. 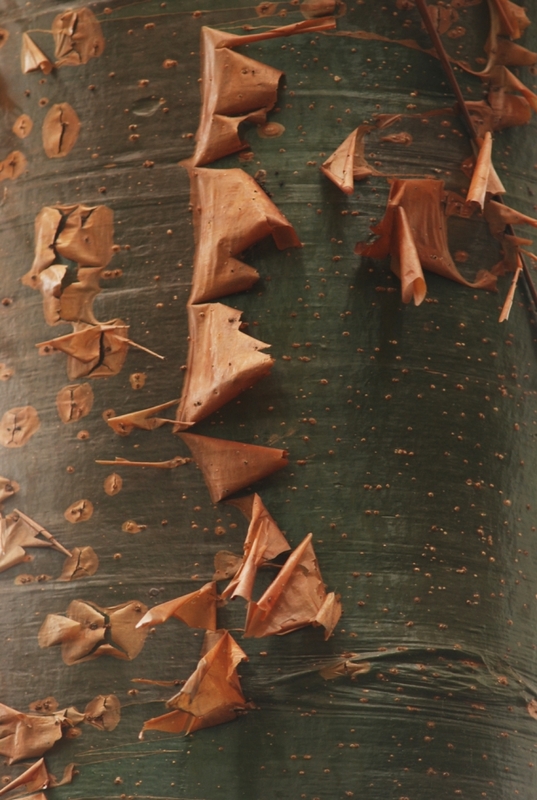 The resin of the tree is used as an incense in religious ceremonies. The bark is used for syphilis, rheumatism, kikneys, fever: The leaves in a decoctions are used for dermatitis of Meroium brownei (a tree that produces burns similar to poison ivy), as well as to treat snake poison, Macerated leaves are used for backaches and rheumatism. The resin is used externally to treat dermic ulcers. The tree is sometimes used for firewood. Bursera simaruba (the gumbolimbo tree), is a Zinacanteco Maya remedy for loose teeth and dysentery but is not used by Tzotzil speakers for incense, although some other Mayans use it so. The Chortí plant a tree as a symbolic cross in preparation for the pilgrimage to Esquipulas. The tree is identified as Bursera simaruba, and it stands at the center rear of the altar area, just as do conventional crosses in other ceremonies (Wisdom 1950:476; Fought 1972:525). Huastec Mayans living in San Luis Potosí, more than 500 miles away from the Tzotzil, and even farther from the Chortí, also utilize Bursera simaruba for purposes other than in­cense, such as in the treatment of burns, headache, nosebleed, fever, and stomach ache, and for predicting rain by its flowering (Alcorn 1984:569). If palo jiote is really used by incense, where is it harvested and processed? Every single book and article on incense or on plants (if complete) lists Palo jiote, Bursera simaruba as a plant used for incense. But when we go to native markets and find incense stalls, most of the incense comes from pine or from the “incense tree” pom. So I have not yet found a village or place where palo jiote is really harvested for incense. Palo jiote, Bursera simaruba tree at Botanical Garden, Guatemala City, July 2011, Photo by Camila Morales.